I wrote the same blog in November 2012, so prices (and sometimes quantities) from 16 months ago are in brackets to show the rise in prices. When first here we lived for RM30 per day, plus rent. Below gives more details of costs of a comfortable life. RM300 in a low-cost condo, with no facilities, and probably in a poor location in a badly maintained building. RM2,500 for a three bedroom two bathroom condo of about 1,000 square feet, with pool, gym, parking space etc. in a nice, reasonably maintained building. And up for bigger, better appointed condos. I think these prices have increased a bitsince I wrote them 16 months ago, but feel presently that the market is in a government induced slump. Electricity is metered, but water is a fixed charge, and you get gas delivered in canisters. Electricity charges were recently substantially raised. We don’t yet know how much more this is actually costing us. The government charges comparatively more per kilowatt for more consumption, so the higher bands have increased substantially. I suspect at least a 20% higher bill. It was about RM200 for electricity, using air cons when necessary, heating water for showers, lighting, TV etc. Expats report bills ranging for less than RM100 up to RM800, depending on their homes, and usage, of course. Our bill is very similar to that of the UK, but in the UK we lived in a two bedroom flat, with gas central heating, but, importantly, we were out of the flat working five days a week, which would have kept the bill much lower. Thus, electricity is costing us less here, even though it cannot be said to be cheap. (UPDATE: During very hot February we used the aircons more. Our usage was 12% (kilowatt hours) more than the bill for December, but our bill was 27% more. RM10 per month for gas. There is no town gas, so you have gas delivered in canisters, costing RM30 (RM27) or so for medium size canister. This has lasted us from about three months to about six months, depending on how much we ate in. RM3 for water; it costs RM6 minimum per two months, and usually we only use the minimum. I use rainwater to water the plants where possible, because the plants seem to prefer it, but in the drier months use town water. Currently a phone line and 4mbps ADSL Internet connection with Telekom Malaysia costs RM140 per month. For 8mbps it costs RM160 per month. RM1,200 per month (RM900) for groceries. There are supermarkets and markets for fruit and vegetables. But if we buy everything just from Tesco, this is an approximate figure, although prices are rising significantly. 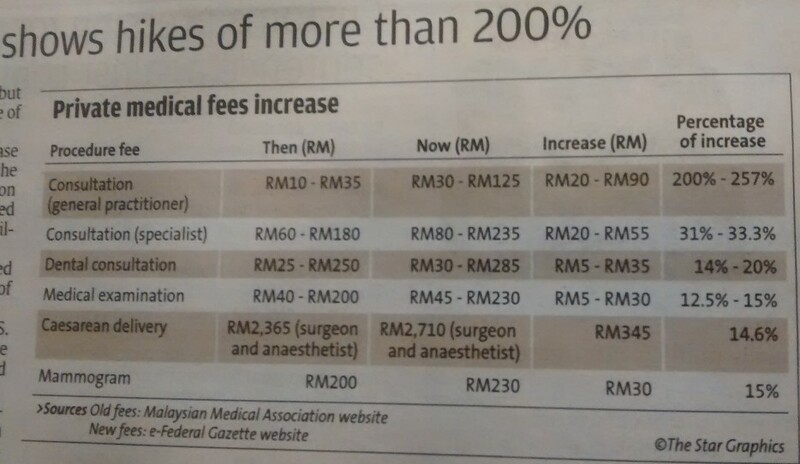 Our insurance agent told us medical procedures are increasing in cost by 20% per annum, so at this rate very soon Malaysia will no longer be a low cost medical destination. RM0 if you are renting. The service charge for the condo is paid by the owner, as is any tax on the property. If you own a house, there is a land tax and a charge for the local council’s services, which amount to about RM500 per annum for both for a modest property. The Malaysian government plans to introduced a GST of initially 6% in April 2015. This is being universally cheered by the media. Since the government seems to expect people/companies to act as their tax collectors without recompense, I assume the extra costs of this tax collecting and accounting will be passed on to the consumers, thus having a bigger than 6% impact. The government has recently substantially increased capital gains taxes on property sales. Now the tax is 30% for properties sold within 5 years, and 5% on properties sold during or after the sixth year. (Previously 15%, then 10%, and after 5 years 0%). RM2.10 (1.90) per litre – I live centrally, so even when I drive it is only for about 10 minutes one way, so in a month I spend less than RM100 on petrol. Car service – about RM400 for a Japanese car to perhaps RM1,000 for a Mercedes. I only need it once a year as everything is close by in Penang, so I don’t drive many miles. Road tax depends on engine size – see this calculator. Some things are really cheap – puncture repair RM8, for example – with immediate and friendly service. Car insurance, of course, depends on the car value and your no claim discount. RM2,000 per year for a medium size car, perhaps, with full no claim discount. RM0.40 (RM0.30)per half hour, and up, on Penang Island, for street parking by coupon (previously meter or with parking attendants). RM5 for parking all day, as a guideline. On weekdays it costs RM1 for three hours parking in Gurney Plaza, on weekends more. You can park free, too, in some supermarkets, on suburban streets, at some businesses. I have heard that metered fares may double soon, but know no more. If so, drivers will apparently “have to” use their meters. It is so long since I caught a taxi I can’t update this figures from last time: RM10 for a short distance, RM15 for about 10 minutes drive, and up for longer. Taxis are supposed to be metered, but drivers usually prefer not to use meters and quote a price – which they usually won’t lower if you try to bargain. Occasionally they will, though. The quoted price and the metered price often work out similar, anyway, and I prefer the former. Pulau Tikus to the ferry terminal is RM15; Pulau Tikus to Queensbay Mall RM35. Pulau Tikus to airport RM55ish. Prices significantly higher between midnight and 6AM, and to the airport there is a special airport charge. Personally I think if you choose a regular taxi company, or several drivers you like, then you will find them honest and reliable, and have no problems. But even picking taxis from the street I have found the drivers honest and mostly friendly – in Penang. As for KL, I hear the situation is different. The ferry to Butterworth is free; returning is RM1.20 as a foot passenger, RM7.70 for a car with passengers. Otherwise there are Rapid Penang buses and their site still says the minimum fare is RM1.40. Beware of pickpockets – friends of mine have had things stolen on the bus. I would take nothing valuable, and only the money I needed, and not travel when the buses are full. There are few seats, so it’s likely you will have to stand. Neither are they reliable, and drivers often don’t speak English. However, they are air-conditioned. Alcohol is highly taxed, and costs more than the UK, and far more than Europe. One 320 ml (330ml) can of Carlsberg beer in a supermarket is RM7.49 (RM6) and up; a 700ml bottle of local vodka is RM23 (good for cocktails), a 700ml bottle of imported vodka about RM120; a 750 ml bottle of vintage wine bottled in country of origin from RM35 if you look around; 750ml sparkling wine from RM70 if on special; imported liqueurs generally well over RM100. Mixers like a 325ml Schweppes ginger ale and tonic water etc. cost about RM1.80 (RM1.50). Coke is now RM1.89. Can be free, at some temples, or on festival days, where shops hand out food, and bottles of water. Generally, eating out is cheap, but drinking alcohol out is expensive. A 660ml bottle of local beer is around RM15 at a hawker centre – but noodles might cost you RM3. Of course western food in upmarket restaurants is far more expensive, and a small glass of wine could cost RM20 or more. Nevertheless, expensive western style restaurants are good value for food if you compare the price to London, Paris, Sydney etc. Local cooking uses far too much sugar, and MSG, so eating out frequently, especially in cheap places like hawker centres, over a longer period is probably not healthy, unless you are very selective. From RM8 (RM7) at Gurney Mall. Yes, very affordable, and cinemas are quite empty weekdays, during the day. Senior discount, when one is over 55, makes it RM1 less. Wednesdays are discount days, too – RM1 less, but seniors get no additional discount on that. I am not at all interested. This is the Malaysian provider. You can join local clubs, such at The Penang Club, The Penang Swimming Club, the Penang Sports Club etc. You need to buy a membership, and then pay monthly dues, which are about RM12,000 and then RM165 monthly for the Penang Club; about RM25,000 membership fee for the Swimming Club; monthly fee appears to be RM45 per month according to their website; and RM15,000 and RM100 monthly for the Sports Club. You can sell the membership in the future, if you wish. So, as you can see, many prices are increasing substantially, with more to come, and this is before the introduction of a GST, which will further increase prices. Did I forget anything important? Let me know if I did, and I will add the details if I know them, or can find them out. Retirement to Penang – could I afford not to? 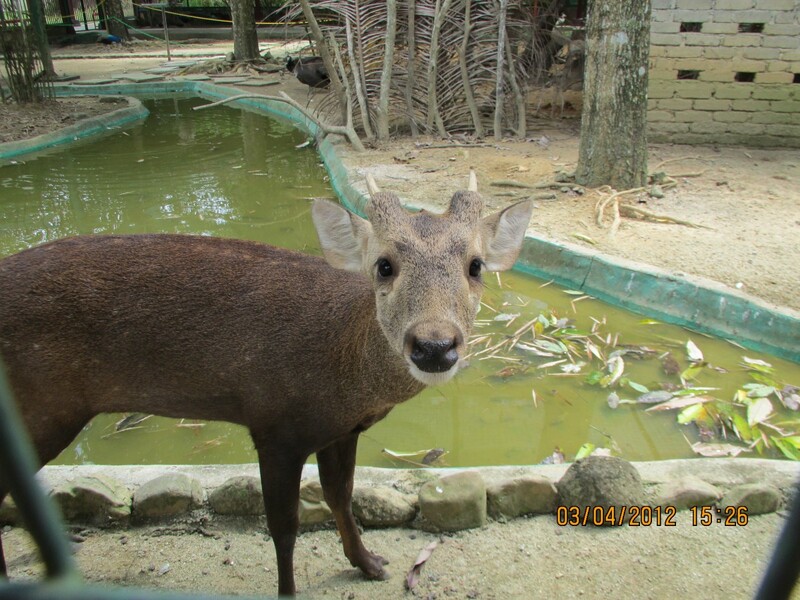 May 2013 update. Research by Bacs Family Finance Tracker claims household bills in Britain have increased by 40 % since 2007. Well, I retired in mid-2007, and moved to Penang in May 2008. Just one more reason for my thinking below. …leaving just enough to live and have a holiday in the sun every year. The only “saving” possible was paying the mortgage, but much of that was siphoned off by the bank as interest. The cost of working was so high that it didn’t seem worth it. Basically I was working to survive in order to work. OK, I did enjoy my work, until near the end, but that is not the point. Just the annual council tax alone in London can be the equivalent of three months living cost in Malaysia. It’s almost as if it’s cheaper to retire abroad than to work and live in London. If you have equity in your property and you sell it, you can buy a nicer property abroad more cheaply, and then live on the difference for many years. Well now I’ll be off to the cinema, where a ticket for the latest film will cost me £1.80. Retirement – could I afford not to? The only “saving” possible was paying the mortgage, but much of that was syphoned off by the bank as interest. Langkawi – December 2012. Holidaying here. Retiring here? One Malay word you should know if you are in Langkawi – “Pantai” = “Beach”. 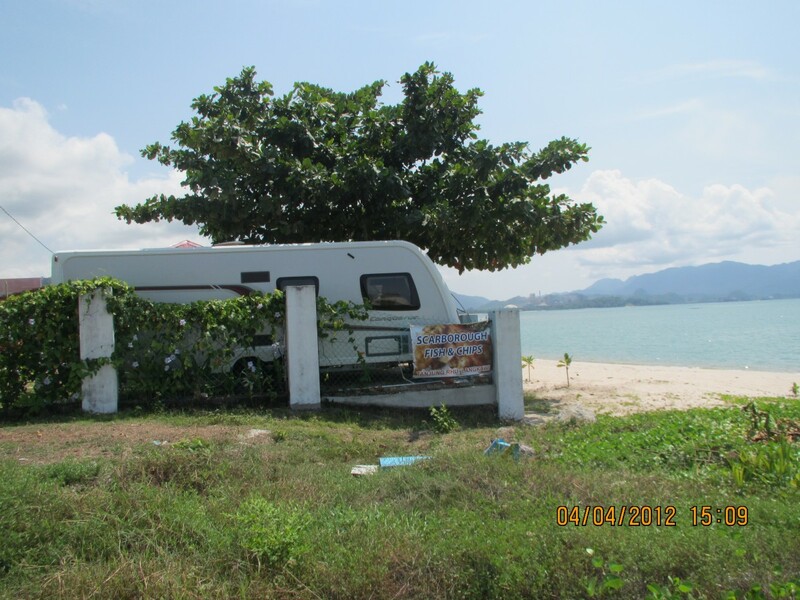 In August 2008 we drove up to Kuala Perlis and caught the ferry over to the main ferry terminal in Langkawi. All we had to do was phone a contact who ran a parking lot, give an approximate arrival time, and he bought the ferry tickets. When we arrived we could park undercover and he gave us the tickets, and pointed out where to catch the ferry. In April we flew on Air Asia from Penang to Langkawi, which is about 25 minutes in the air, but from when we left home by taxi to when we were in our hotel room about four hours had elapsed. Which was about the same amount of time as driving and catching the ferry, although the flight was less strenuous. RM300 in a low cost condo, with no facilities, and probably in a poor location in a badly maintained building. RM200 for electricity, using air cons when necessary, heating water for showers, lighting, TV etc. Expats report bills ranging for less than RM100 up to RM800, depending on their homes, and usage, of course. Our bill is very similar to that of the UK, but in the UK we lived in a two bedroom flat, with gas central heating, but, importantly, we were out of the flat working five days a week, which would have kept the bill much lower. Thus, electricity is costing us less here, even though it cannot be said to be cheap. RM10 per month for gas. There is no town gas, so you have gas delivered in canisters, costing RM27 or so for medium size cannister. This has lasted us from about three months to about six months, depending on how much we ate in. RM900 for groceries. There are supermarkets and markets for fruit and vegetables. But if we buy everything just from Tesco, this is an approximate figure, although prices are rising significantly. RM400 for two of us for policies covering hospitalisation, taken out locally, but covering world wide. Visiting a doctor in a clinic costs around RM35, or in a hospital RM80 or more. RM0 if you are renting. The service charge for the condo is paid by the owner, as is any tax on the property. If you own a house, there is a land tax and a charge for the local council’s services, which amount to about RM500 per annum for both for a modest property. RM1.90 per litre – I live centrally, so even when I drive it is only for about 10 minutes one way, so in a month I spend less than RM100 on petrol. RM0.30 per half hour, and up, on Penang Island, for street parking by meter or with parking attendants. RM5 for parking all day, as a guideline. On weekdays it costs RM1 for three hours parking in Gurney Plaza, on weekends more. You can park free, too, in some supermarkets, on suburban streets, at some businesses. RM10 for a short distance, RM15 for about 10 minutes drive, and up for longer. Taxis are supposed to be metered, but drivers usually prefer not to use meters and quote a price – which they usually won’t lower if you try to bargain. Occasionally they will, though. The quoted price and the metered price often work out similar, anyway, and I prefer the former. Pulau Tikus to the ferry terminal is RM15; Pulau Tikus to Queensbay Mall RM35. Pulau Tikus to airport RM55ish. Prices significantly higher between midnight and 6AM, and to the airport there is a special airport charge. Personally I think if you choose a regular taxi company, or several drivers you like, then you will find them honest and reliable, and have no problems. But even picking taxis from the street I have found the drivers honest and mostly friendly – in Penang. As for KL, I hear the situation is different. The ferry to Butterworth is free; returning is RM1.20 as a foot passenger, RM7.70 for a car with passengers. Otherwise there are Rapid Penang buses. Presently I am boycotting them for a year after my last experience, so I can’t remember the fare, but their site says the minimum fare is RM1.40. Beware of pickpockets – friends of mine have had things stolen on the bus. I would take nothing valuable, and only the money I needed, and not travel when the buses are full. There are few seats, so it’s likely you will have to stand. Neither are they reliable, and drivers often don’t speak English. However, they are air-conditioned. Alcohol is highly taxed, and costs more than the UK, and far more than Europe. One 330ml can of beer in a supermarket is RM6 and up; a 700ml bottle of local vodka is RM23 (good for cocktails), a 700ml bottle of imported vodka about RM120; a 750 ml bottle of vintage wine bottled in country of origin from RM35 if you look around; 750ml sparkling wine from RM70 if on special; imported liqueurs generally well over RM100. Mixers like Schweppes ginger ale and tonic water etc. cost about RM1.50. From RM7. Yes, very affordable, and cinemas are quite empty weekdays, during the day. You can join local clubs, such at The Penang Club, The Penang Swimming Club, the Penang Sports Club etc. You need to buy a membership, and then pay monthly dues, which are about RM12,000 and then RM165 monthly for the Penang Club; about RM25,000 membership fee for the Swimming Club; monthly fee unknown; and RM15,000 and RM100 monthly for the Sports Club. You can sell the membership in the future, if you wish. Langkawi – some observations from my latest visit. And could I retire here? 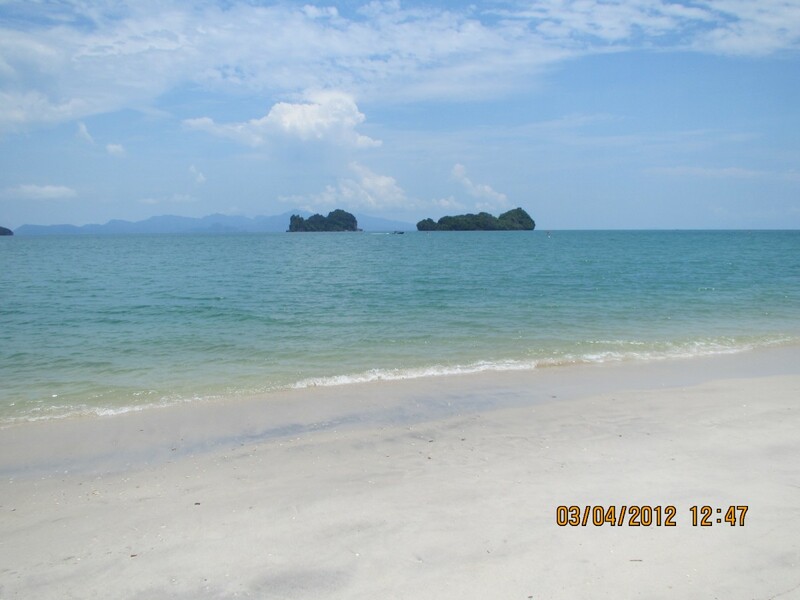 I have just returned from my second holiday in Langkawi in about three and a half years. So, while I cannot claim any vast knowledge, I would like to make a few observations. For a newer version click the green button. This time we flew on Air Asia from Penang to Langkawi, which is about 25 minutes in the air, but from when we left home by taxi to when we were in our hotel room about four hours had elapsed. Which was about the same amount of time as driving and catching the ferry, although the flight was less strenuous. There are other alternatives, such as a ferry from Penang to Langkawi, directly; or driving to Alor Setar, and catching a ferry from there. High season is supposed to be between mid-November and mid-April, which corresponds to the dry season -but we got low season prices in early April, and rain didn’t bother us. As I mentioned, we’d previously visited in August, and again we had no problems with the weather. Langkawi has changed quite a bit in the intervening three years. Now there is a vast range of accommodation available – from very cheap to very expensive (resorts), and many choices in between. Cenang Beach is the mass tourism area. There are a lot of motels now, homestays all over the island, and you can even stay in a caravan at a beach. Or you can camp at the government fruit farm, mentioned below. Car rental is cheap – from RM40 or so a day for an old car in poor condition, RM70 for a newish car in good condition, and motorcycle hire is also available. It seems you can also rent bicycles. If you rent a car, check the tyre condition before you drive off, too. They will also give you a road map, most likely. Of course, there are taxis; and buses exist, but I saw very few, so you’d need a lot of time. 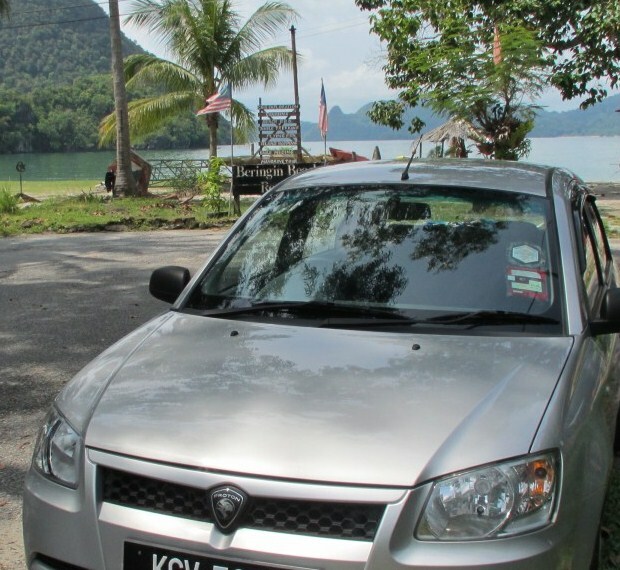 This one year old Proton Saga cost RM70 a day to rent, and RM50 deposit. The standard of driving in Langkawi is better than in Penang, and there are not so many cars on the road, so driving can be quite relaxing. As Langkawi is quite small, it doesn’t take very long to get where you are going. I think it took about 40 minutes to drive from the crocodile farm in the north-west, to Kuah, the main town, in the south. You are warned not to drive at night because of cows and water buffaloes on the road. 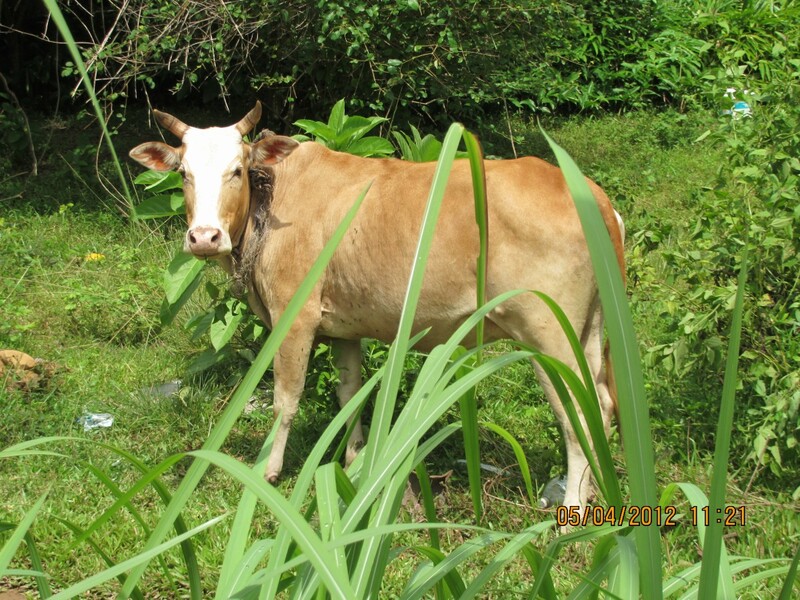 Cows are a tan colour, and not so hard to see, but water buffalo are black, and hard to spot. As a tourist there are some nice things to do, and the airport tourist office has brochures and maps, of course. I’ll just mention a few activities. Our favourite beach is Tanjong Rhu in the north of the island – but there are some other nice beaches, too. And there are no jellyfish – at least at this time of year – so you can swim in sea. As you approach Tanjong Rhu there is an open manned barrier for some reason – just slow down and drive through. 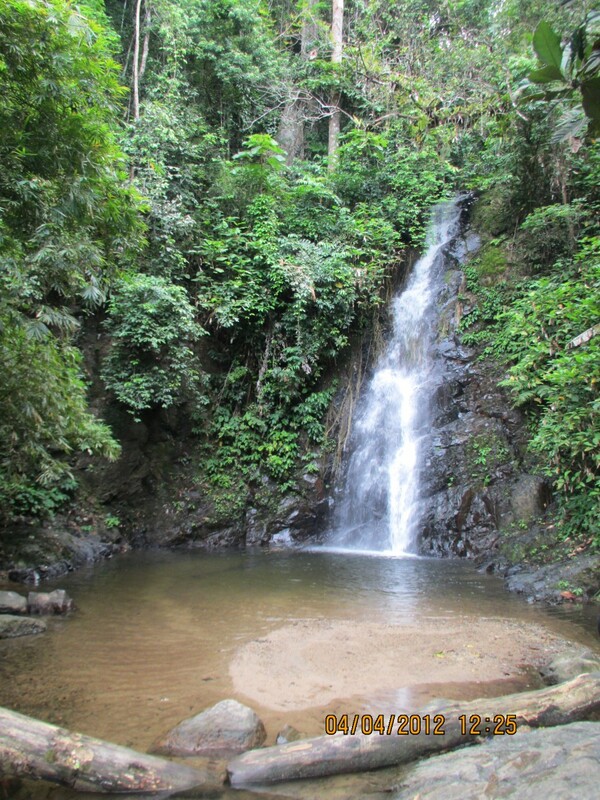 You can also swim in waterfall pools in the jungle. When we were there we could walk off into the jungle and not get attacked by mosquitoes – much. We did get the odd bite, but nothing like the jungle, or even anywhere outside, in Penang. 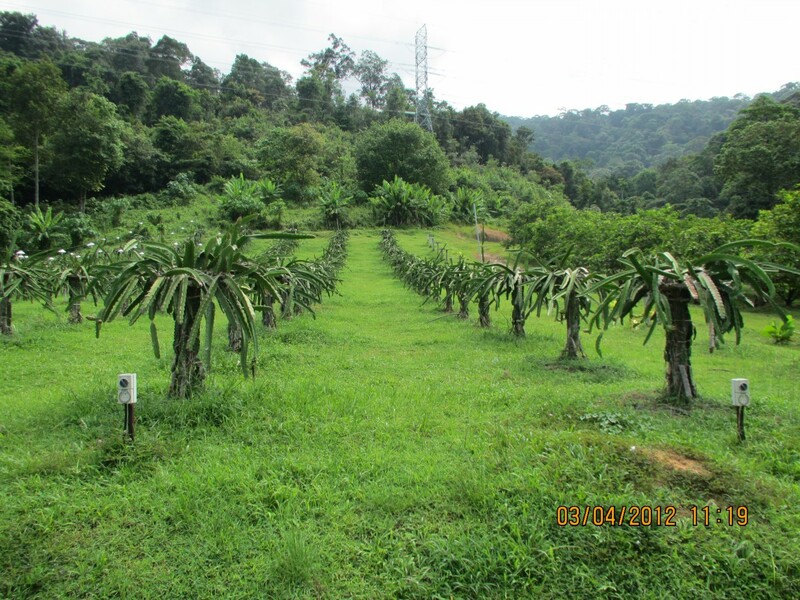 The government agricultural research facility – Taman Agro-Teknologi is interesting. They take you on a bus within the grounds to eat the fruit in season, and then drive you around, stopping to show you different fruit trees and landscapes. 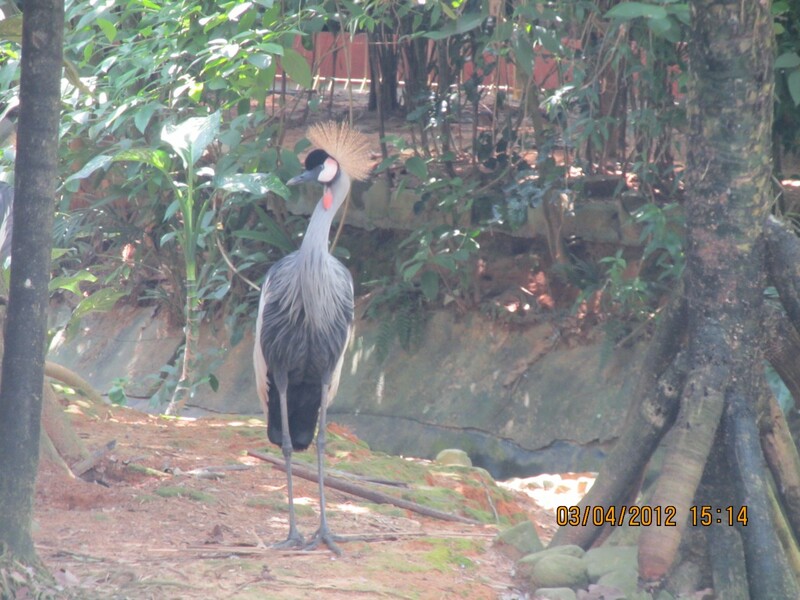 And the Bird Paradise and Wildlife Park is worth a visit if you like birds. Many attractions charge tourists a higher price than Malaysians. I dislike this, so I asked if I could get the lower price as I was a resident; and I showed my Malaysian visa. I was charged the lower price, which was RM15 instead of RM22. The tickets we were given had printed on them that they were children’s tickets. This question is worth trying everywhere there is discriminatory pricing. There is far less litter than much of Malaysia. It was so nice to see beaches and jungle paths with the only litter being leaf litter. This is so different from elsewhere in Malaysia. Food more expensive than Penang and it is much more expensive to eat out, and there is less variety. Since we live in Penang we didn’t really see the point in spending a lot on food, so we had a big breakfast at the hotel, which was included, and ate fairly lightly later in the day. The biggest variety of restaurants is in Cenang Beach. Kuah, the main town, of course has restaurants, too, as do the various malls. And there are the usual hawker centres and roadside stalls. 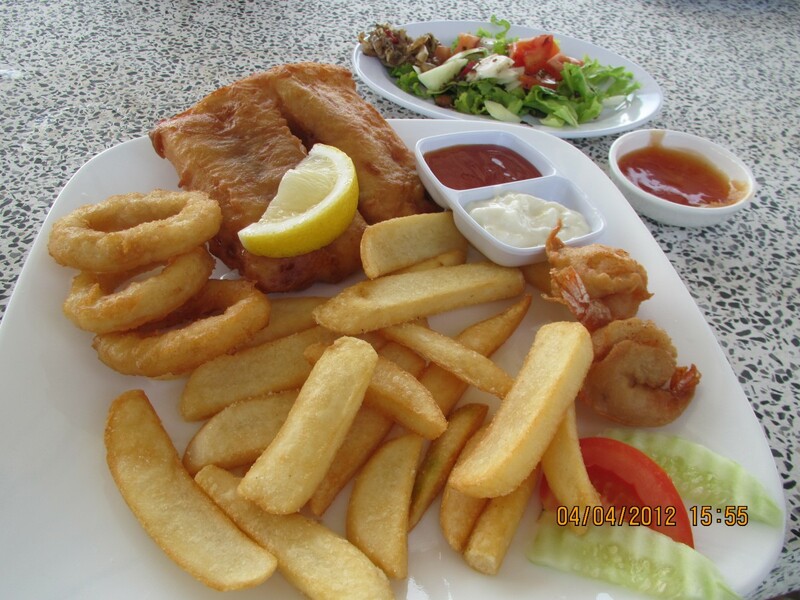 We enjoyed fish and chips on the north coast, however. 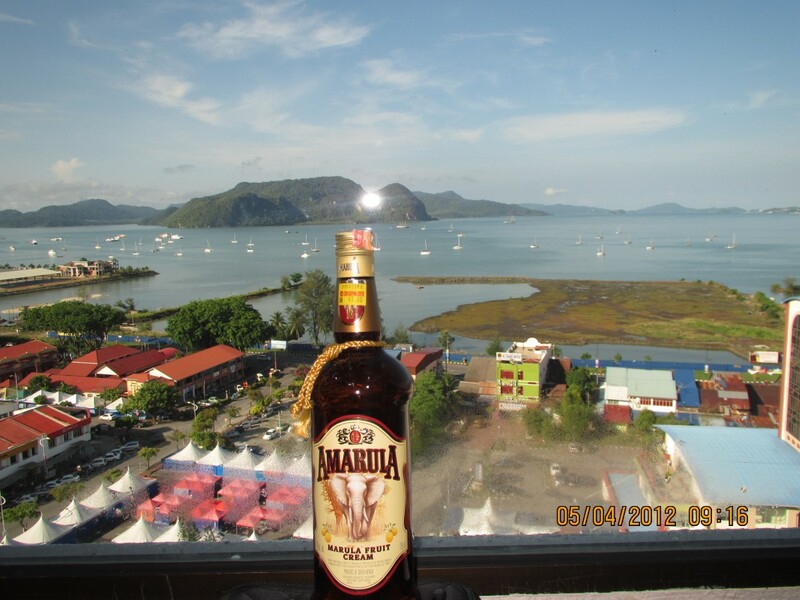 Of course, Langkawi is tax-free for at least alcohol and tobacco products. There are many duty-free stores, but probably the cheapest are in Kuah. It also means restaurants often charge a lot less for alcohol, too. A can of Royal Stout cost me RM1.80 in a store. Sparkling wine costs RM30 and up, and champagne RM150 and up. For more, read this on Langkawi’s tax status. I think it is too quiet for me to retire here, and too isolated – you can’t just drive onto the mainland and go somewhere. And I would miss the variety and low price of food in Penang. Certainly the tax status of Langkawi is attractive, though. A local Japanese lady we spoke to said that the two downsides of living in Langkawi are you really need to speak Bahasa, and for some hospital treatment you have to go to the mainland – Penang etc. However, if you wanted a very quiet life, perhaps it would suit you, if you had no medical concerns. Bahasa doesn’t strike me as too difficult to learn. I have so much to do, I don’t know how I ever found time to work. I wake up about reasonably early – dawn varies from about 7am to about 7.30 depending on the time of year – do some meditation, some Reiki, and drive the three minutes to the club, where I sungaze, swim, sauna, use the gym for few minutes, walk along the beach, and then after a shower relax with a cup of coffee and read the paper with a lovely view of the sea. A short drive home and then I’ll check my plants and water them. Or wander over to a local dim sum restaurant. Or I might breakfast at home on some fruit and home made yoghurt, and then go out for a buffet lunch at the E&O Hotel. But if we are eating out or socialising in the evening, then I’ll eat lightly, probably at home. If there is no shopping to do I will proceed with some study, some Internet, or a bit of DIY around the house. Of course, there are plenty of day or over night trips to make if we feel like it, to local attractions or nearby towns,or even up to Thailand (a two hour drive). An afternoon nap leaves me with plenty of energy to do whatever we choose for the rest of the day. This is also a good time for a fruit smoothie. Every day is different, and I never get all that I want done in the day, anyway. It’s a tough life.